The next SMQG meeting is Saturday, April 20, 2019 at the Fruitville Library meeting room. After a short business meeting, bring a quilt for Show and Tell. The Photo Inspiration Challenge is due at this meeting! Click here for more information on this challenge. Come join us for a fun quilty day! 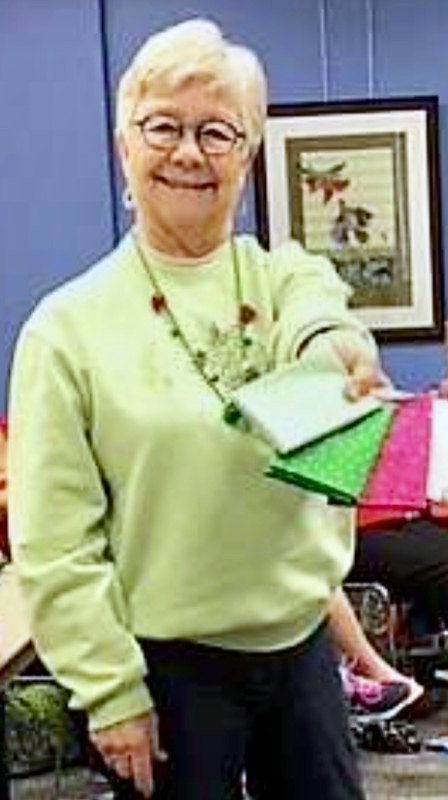 At show and tell, Carole Lyles Shaw showed her newest patterns. Gotta love the bright bold modern colors! Between the crosses, row on row,..."
How perfectly Lynn's design captured the essence of the poem. Other news - check out the new photo's in the Notable tab of the many quilts shown by our members at the Friendship Knot Quilt Guild show earlier this month. Click here to see the quilts. Nashville was rainy and gloomy outside but inside the quilts sparkled with color and gorgeous quilting! Our charity quilt was hung in the main hallway at the MQG vending booth. A surprise hit of the show was the beautiful top Christine wore the first day. Many stopped her to compliment it, ask the name of the pattern (Indigo Junction's Sophia Swing Coat), ask where to buy the fabric etc. Christine's beautiful coat was a hit! All who attended had a great food, fun shopping, classes and lectures, and their fave quilts there etc - Let's share at the March meeting Show and Tell! The March 23, Rule Breaking Workshop is full. The next SMQG meeting is March 16, 2019 at Fruitville Library. after a short business meeting bring a quilt for show and tell. This months program will be Sew Time... Click here for more information. The Rule-Breaking Workshop is Saturday, March 23, 2019 led by Donna Koenig. There are a couple spaces open so sign up on Groupworks. For more information click here. Deborah Iversen quilt -just glows!